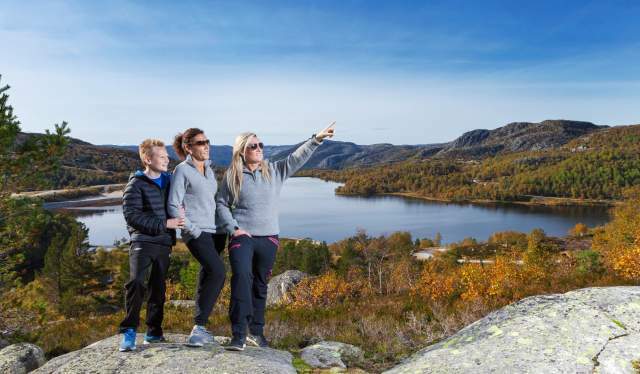 Family hiking tours in Kvinesdal Norway. Experience the top five hiking tours in Kvinesdal. From the mountains and fjords, there are tours for both adults and children. The Kvinesdal region stretches from the sea to the hills offering many good hiking trails. In the south along the seaside, the hiking tours are in hilly terrain from the shore and up to about 300 m above sea level. These trails end with stunning views over the fjords and sea. In the north you will experience mountain scenery on the hiking trails. Here you can find marked trails of varying length and difficulty. In the south of the municipality at a place called Feda, there are 12 different tours plotted on maps where you can go hiking. These maps can be obtained from the Kvinesdal tourist office. Enjoy a walk and experience some history and stories along the way about a preacher and his family. Hike along Barnevandrerstien (The child wanderer trail) with Heddan Gard Gjestegard as a base. This is the first few kilometers of the children's walking trail that runs from Kvinesdal. The trail is divided into seven stages totalling about 136km to Landvik in Grimstad. The terrain is quite open and passes several beautiful lakes with a great vantage point along the way. The highest point on the first leg is about five hundred meters above sea level in front of 'The Priest' which is approx 2/3 of the first leg ending at the memorial park at Snartemo. Parallel to and slightly south of the children hiking trail passes the so-called 'Prestvegen' (Preachers Wall) . A legend tells of a priest that drove by horse and sleigh on the ice and snowy roads of Kvinesdal to Hægebostad church. Along the way he came out of a strong snowstorm. When he arrived at 'Vegvisarstein' (road view stone) he threw out some salmon to ease the load on the sleigh. So now there is a signpost that says 'laksen' (salmon). Futher east they had to stop the sled because the horse plunged over the cliff at Stora Hestvatnet (there are signs where this happened). The legend tells that a small choir boy and the dog that was with the priest died at Grotjødn (signposted). There is also stone cross where the priest died. It is said that the priest's wife was the last to die and there is a top of the mountain named after her called Prestefruå (Priest's wife). Dyreknuden (Animal knot) is a 291 metres high point in Sandheia located just west of Sande and southwest of Feda center . Here visitors can go on a round trip starting and stopping in Sande. This is a steep rock outcrop where there are ropes fastened to the rock to assist getting up and down the steepest areas. At the top, there is a beautiful fjord view over Varnes and Lista. Here visitors can continue to Haugeland Beach by following the marked trail. This trip is quite demanding with many steep distances to cross. In the Haugeland Beach area, there will be two new buildings that will eventually be available to rent for accommodation. On the way back from the Animal Know alongside of Sande ,visitors can take a slight detour to a mountain plateau that runs vertically down the fjord and has a fantastic view. The estimated time and distance depends on which course visitors choose. Falk Fjellstøl is located on the hills between Risnes in Kvinesdal Municipality and Sirdal. The farm is owned by the Kvinesdal and Sirdal Municipality who ensure that the farm will be open for visitors. Falk Fjellstøl has a long and interesting history as it is in the middle of the route used by miners who took over from Sirdal to the Knaben mines. It was also important for farm people on Risnes every summer when the hay Harvest should be done around the farm. There were previously two barns on the farm. The farm house has three beds with mattresses and cooking facilities on a gas stove. There is also a wood stove so you can fire and get warmed up a bit. Water can be found in the creek just off the farm. The walk is marked with red paint on trees and rocks. It starts with a fairly steep rise until it flattens out on top. Thereby visitors will pass a beautiful mountain lake on the trip inland which is ideal for swimming. The trip is mostly on track but there is also some marshland which can be soft and a little difficult at times. The route can continue to Tonstad by following the marked trail further west . Just outside of the centre of Kvinesdal is Knebeknuten. There is a small dirt road that 4WD vehicles can drive up that will take you near the top. During the summer months normal cars can also get to this location but caution should be maintained at all times - it can be dangerous. The road stops near a farm house and visitors can walk from there along a little track beside it which leads to the top. It is a steep little walk and when you reach the top the views are simply amazing. The views from here are also higher than that of the local Utsikten hotel. This hiking tour is a round trip with great viewpoints along the way. From 1907 to today, this area was very central to the connection between east and west. Before the road was built between Flekkefjord and Lyngdalselva, people travelled here by boat across the bay to Feda. You can find more information on Lister Friluftsråd&apos;s webpages or contact the Kvinesdal Tourist Office for more information and maps.